Welcome back! Here it is, our last dinner out of our one pork shoulder!! 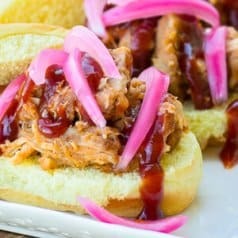 If you don’t know what in the world I am talking about, please visit the original recipe for crock pot pulled pork. 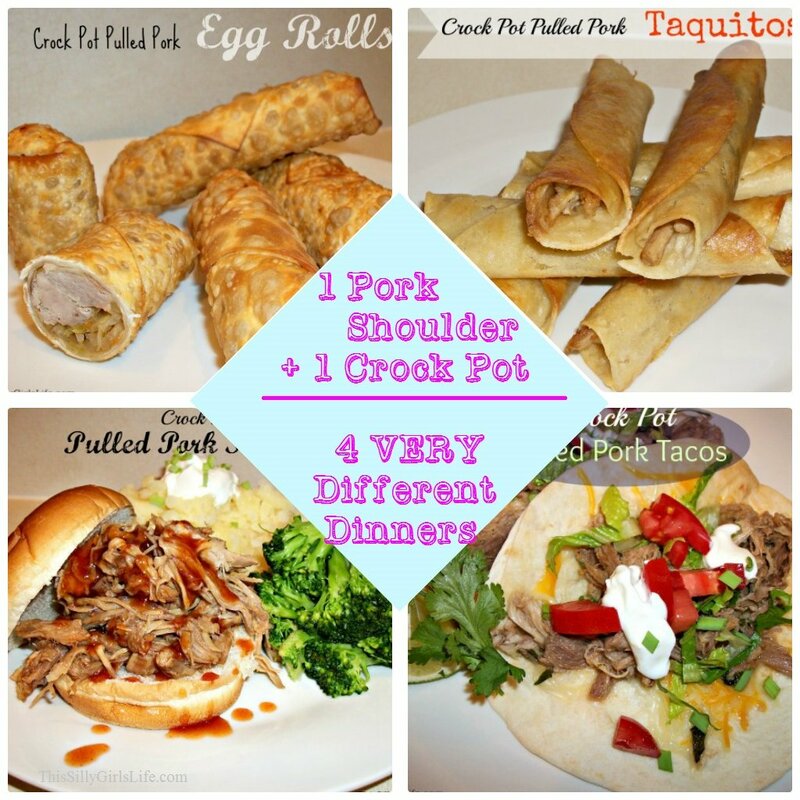 I will be showing you how to make these delicious crock pot pulled pork egg rolls. They are very simple but take a little while to prepare. 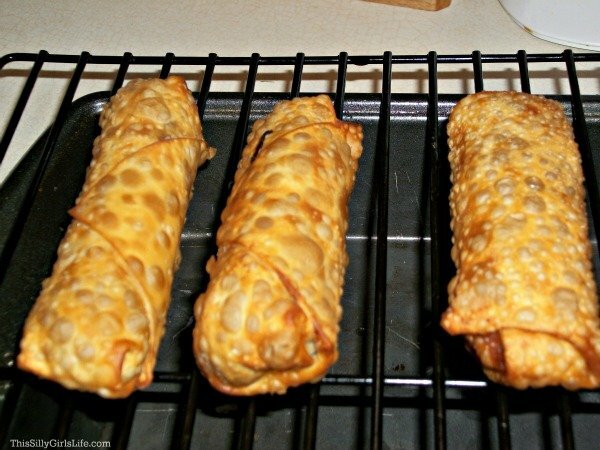 Make sure you allow yourself a few hours ahead of time for these yummy egg rolls! While the veggies are steaming mix the sauce. 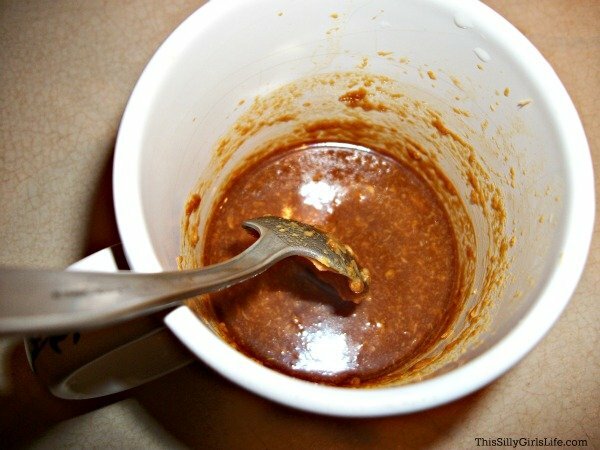 You want to mix all of the remaining (except the pork and egg roll wrappers) ingredients together in a cup or bowl. Add the sauce to the pan when the veggies are done cooking. Cook out any excess water and mix thoroughly to combine. When veg is evenly coated place a mesh colander over a bowl to allow the veggies to strain any liquid off. While you are rolling them, get a pan over medium heat on the stove. Add enough vegetable oil to cover about 2 inches up the side of the pan. When your egg rolls are rolled and the oil is hot, place them one by one into the oil. They fry up very fast so keep your eye on them! These really take about 2-3 minutes and they are done. Make sure you turn them over about half way through cooking so they are golden brown on all sides. When they are done cooking place on a cooling rack over a pan to let the excess oil drip off. And that’s it! I served sweet and sour sauce and hot mustard to dip these in! 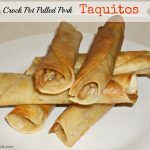 We had these for a meal with some fried rice, but they would be great appetizers at a party or just as a snack! I hope you enjoyed, if you have any questions don’t hesitate to as, thanks for reading! I served sweet and sour sauce and hot mustard to dip these in! 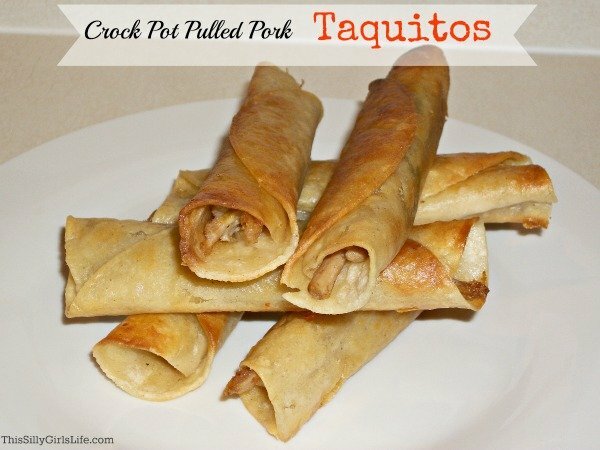 We had these for a meal with some fried rice, but they would be great appetizers at a party or just as a snack! In a wok or pan on medium heat add the vegetable oil allowing to get hot and add the ginger and garlic. 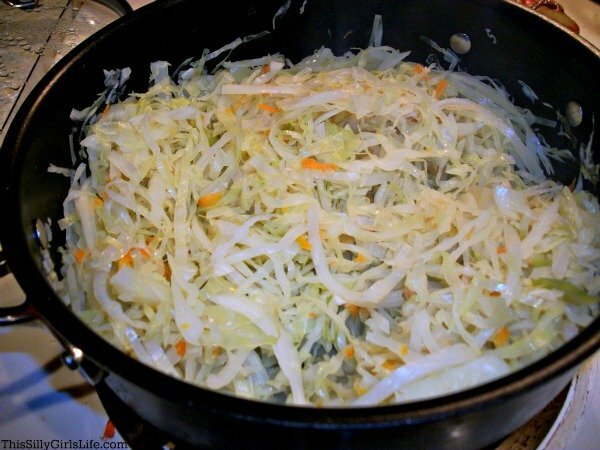 Saute just until fragrant and add the cabbage and carrot to the wok. Toss to coat in the oil. Now, we are going to steam the veggie mixture. Add about 1/4 cup of water to the pan and cover. Allow veggies to steam like this until tender, soft and wilted around 20-30 minutes. Check every few minutes to make sure there is still water in the bottom of the pan and mix veggies as well. If you need to add more water, add some you do not want the pan to get dry. Place this into the fridge for at least an hour or until ingredients are cool to the touch. You will get about 1/2 cup of liquid that drains off, just throw this away. Now, you are ready to roll the egg rolls! You will need to make a flour “paste” Just combine equal parts of flour and water to form a paste to close the egg rolls, you don’t need too much! You will need to get a station prepared so it is easiest. 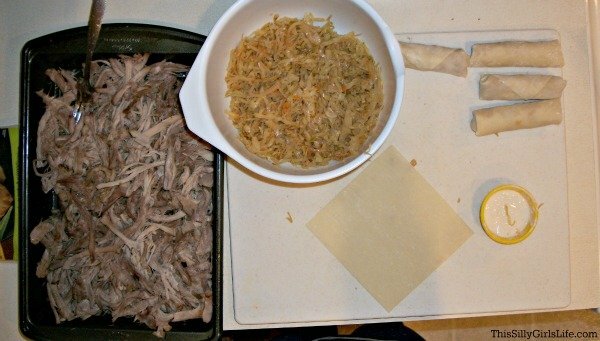 Check my blog post for this recipe to see how to roll egg rolls. While you are rolling them, get a pan over medium heat on the stove. Add enough vegetable oil to cover about 2 inches up the side of the pan. 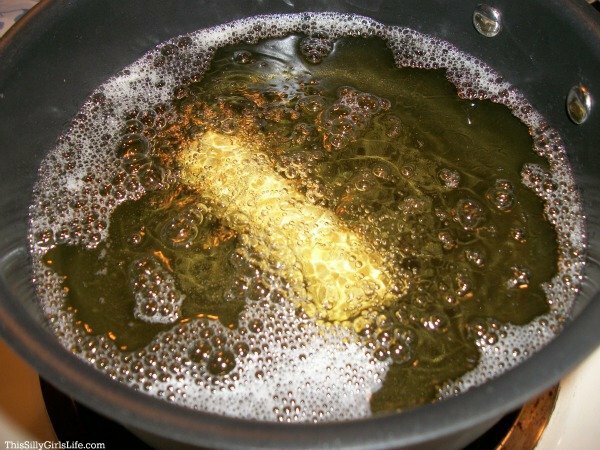 When your egg rolls are rolled and the oil is hot, place them one by one into the oil. They fry up very fast so keep your eye on them! These really take about 2-3 minutes and they are done. Make sure you turn them over about half way through cooking so they are golden brown on all sides. When they are done cooking place on a cooling rack over a pan to let the excess oil drip off. These look absolutely delicious! Thanks so much for sharing!!! Stopping by from Hoyby Crafts! Looks great. Never made egg rolls. Thank you for sharing. 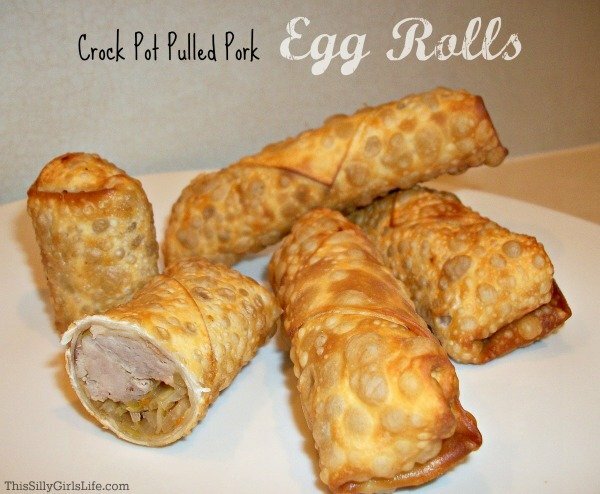 Eggrolls are one of my very favorite foods but I have been terrified to try them out myself. Thanks so much for the tutorial…I may get over my fear after all. 🙂 Thanks for linking up to Pin It Tuesday. I hope you do try them, let me know how they come out! OMG! That sounds really good! The egg rolls look delicious. 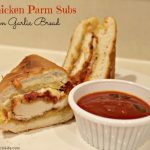 I found your post on Foodie Friday. I submitted NY Cheesecake. Cheesecake is my Hubby’s favorite! Yum! I saw your recipe on “My Turn for Us” Freedom Fridays! Thanks so much, I’m going now! O my! I can not wait to try these!! PINned your post to our Pinterest board!! Thanks for linking up with us at One Sharendipity Place this weekend!! These sound so good! Yum! Thank you so much for sharing at last week’s All My Bloggy Friends 🙂 I can’t wait to see what you share this week! I love less mess, LOL. I didn’t think I would get the same color in the oven, does that work for you?? These look so delicious! I LOVE egg rolls. Thanks for linking them up at Think Tank Thursday. 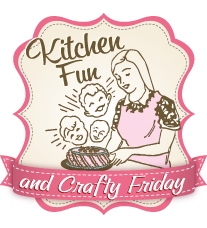 I have featured them today! Found you on the Chicken-Chick blog hop. These look very yummy!! Adding to my Recipes list! Thanks so much Kathy! 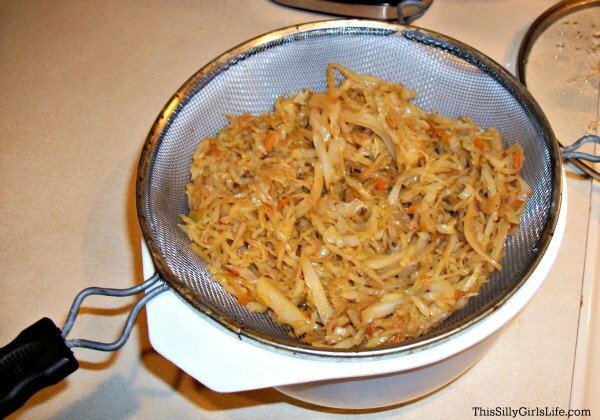 You could definitely substitute the cabbage for more carrots, bell peppers, onions, celery, all of them or a combination would work. Just make sure they are still cut thinly, cook everything the same way and you’re good to go! These are so good!!!! I sauté some sweet onion with the ginger and garlic (love the onion flavor) The only problem I have is I can never fold the egg rolls right-they always come out deformed lol but my husband loves them. Sometimes we eat half the peanut butter cabbage mixture before it can get into the wrappers!